House of Lawe was started by a group of women who have dedicated their work to “Conserving Tradition, Promoting Culture, Empowering Women, Enriching Life” (House of Lawe 2015). The Sisterhood of Lawe is a program run by the House of Lawe to provide support to artisans, giving them strength and self-sustainability. From West Sumatra to Maluka there are many traditional styles of weaving, each with their own motif and method of crafting. Many of the artisans are economically disadvantaged and therefore cannot afford to continue practicing their crafts (GEF SGP Indonesia 2014). Hand woven textiles produced using eco-friendly dyed threads or “lawe” by artisans across Indonesia are sent to Yogyakarta, where the House of Lawe and the Sisterhood help develop the textiles into a product. 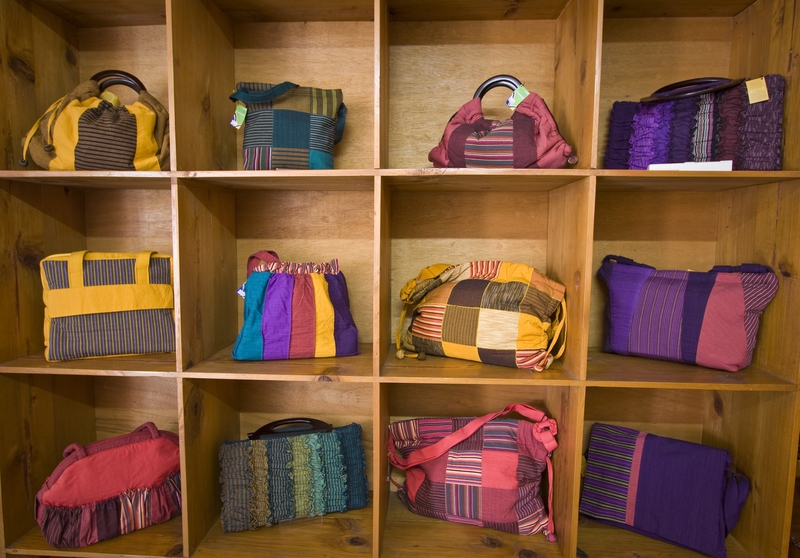 By discussing design and market direction with the artisans they are able to transform the hand-woven textiles into a line of products such as bags, wallets and fashion clothing which are sold through a variety of outlets such as gallery stores, hotel shops or markets (GEF SGP Indonesia 2014). The Lawe craft class in Yogyakarta provides women with technical and production skills, entrepreneur training and knowledge of sustainable practice so they have the capacity for maintaining successful and sustainable lives in their craftsmanship. The classes in Yogyakarta specialise in training women to utilise waste materials by cutting patterns effectively to reduce wastage of fabric. Any off cuts are supplied to other craft classes, which are recycled into new products (House of Lawe, 2015). The sales profits are not given back to the group of weave artisans in the form of money but rather by enhancing their capacity to learn and improve their practice through providing equipment and skills training. The Sisterhood provides the artisans with some income by purchasing their hand-woven textiles. They also fundraise through collaborations with initiatives such as “Tenun Untuk Kehidupan” or “Weaving for life” who have collaborated with young designers in Yogyakarta to produce a clothing range using the artisans’ hand woven textiles (House of Lawe 2015). The House of Lawe hopes to establish a Sisterhood in every area where local women practice traditional weave. This will lead to more support for the artisans, which will become the main economic driving force for these women. For this model of organisation to be able to help the wider Indonesian community in becoming more sustainable in fashion and textiles production, House of Lawe will need to encourage other local manufacturers to practice the same sustainable standards. This could be a very long process as most business in the industry are privately owned and regulations are rarely enforced. In addition to this, ethical production standards will need to be better regulated and enforced. Watch this short video produced by GEF SGP Indonesia about the House of Lawe to get more of an insight into this organisation. Here are some opinions from Anna Sutanto about the House of Lawe and sustainable and ethical fashion. Her responses helped me understand this organisation from a local’s perspective and how they will have to continue working to build a sustainable and ethical industry in Indonesia. Do you think Indonesia’s fashion and textiles industry is moving towards an ethical and sustainable future through organisations such as House of Lawe? Yes, organization like House of Lawe certainly helps to introduce ethical and sustainable fashion standards to wider public, however to expect other industry to apply the same standards will require a long process especially as most textile industries are individually owned and the regulation enforcement is weak. In what ways do you think the industry can improve their sustainable practice? By ensuring the production is truly sustainable, for example through the use of natural colour or colouring substances with less environmental impacts. From the website, they stated that they started to use eco-friendly colouring since 2014 and mainly to allow product for export. How about for local products? Do you think the Indonesian consumer market is motivated to support sustainable fashion? why/why not? Yes, especially for the like-minded people who already support ethical and sustainable fashion standard or for people who wants to purchase as the products bring prestige to the owners. However, I think Lawe’s products are mainly aimed for tourists or export market. To motivate Indonesian to support sustainable fashion, will be a sloowww process. Do you support organisations like House of Lawe through purchasing their products? Yes, whenever possible and also depends on the state of my bank account. What are your opinions about their products? The products are beautiful, but some are not very practical to use. A really cool organisation that promotes local industry and sustainability! Also the fact that it is based in Yogyakarta is a bonus as we will be going there. POST D: Smoking, A Male Act? Post D: Was it really Acting in ‘The Act of Killing’? POST B: Plain Packaging – Has This Been A Successful Design Initiative For Tobacco Control? Post A: You can say ‘No’! POST C: Religion and smoking in Ambon? POST A: Design activism challenges. A comparison of tobacco advertising between Indonesia and the USA. POST C: MAGNO by Singgih Kartono. POST D: The ever-so intricate: Batik. POST C: SMOKING, AS ‘SWEET’ AS CANDY? Post A: Marjinal – Indonesia’s Punk Activists. Post B: Paul Ketz Recycling Initiative. Post D: Punks Fight For Freedom. Post C: Interview with Lawrencia Noerdjaja on ‘The Indonesian Night Markets’. POST A: How does local context and cultural sensitive shape design? Post B: How can we end the smoking epidemic whilst raising money for cancer patients? POST A: What does design mean in different contexts? Post D: Tobacco’s Fountain of Youth. Hello Indonesia Global Design Studio! POST D: The Traditional Beauty Architecture of Indonesia. (POST B) Who Funded this Garden of Eden? (POST A) Food as Design? You bet! Post D – Indonesian Punk – Punk’s Not Dead! Post D: Kopi Luwak, Yes or No? POST C: Daily Life and Design. POST A: The Parameters Of Tobacco Promotion And Demotion, And The Ethics Of Change. Post B: Community enforcement proves more effective than government legislation in the Arab district of Surabaya. B. Here to harm or here to help? Post B: Is smoking just always going to be considered cool? POST D: Erupting volcano; natural disaster or natural phenomena? Blog post D: Smoking for the economy, work environment and social interactions. Post B: Well Intended Trauma. Gruesome public advertising for a cause. Post B: Design Lead System Change – Down with the Refrigerator! What is the future of travel for the environmentally conscious individual? Post A: How is art able to continue cultural tradition? Post C: To be addicted or not to be. Post B: One of the many guides to breaking up with tobacco. Post B: mPOWER, the Tobacco Control package for countries of all shapes and sizes. POST D: Javanese Speech Levels and it’s place in the 21st century. Post C: An interview with a modern student. D. Smoke free? Locations in the Arab quarter of smoke free environments. B. Malaysia’s “Tak Nak (Don’t want)” campaign. Post D: Lama hidup revolusi! Post B: New York is going green!